Oil-free, this fusion chili dish stew brings new levels of flavors and greatly increased nutrition to these classic dishes. Barley replaced the potatoes in a typical stew. Fennel not only adds nutrition but brings a sauce’age flavor to the party while the red peppers bring the spice. Add a rich thick stew-like broth and it creates a guilt-free, comfort food that is not only satisfying but incredibly healthy. The barley will absorb 1 ½ cups of the liquid so it is important we add an equal amount. 1 cup of this liquid will be countered by the liquid from the beans. 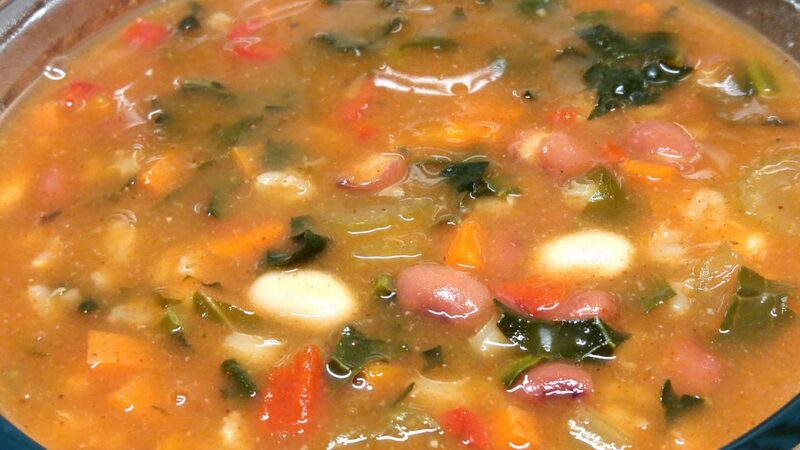 Put the beans aside and combine 5 ½ cups low-sodium veggie broth with all ingredients. Bring to a boil then cover and simmer for 50 mins. Add both beans including the liquid. Combine ½ cup of the remaining veggie broth with the 5 Tbsp of arrowroot or cornstarch. It will thicken the soup in seconds.